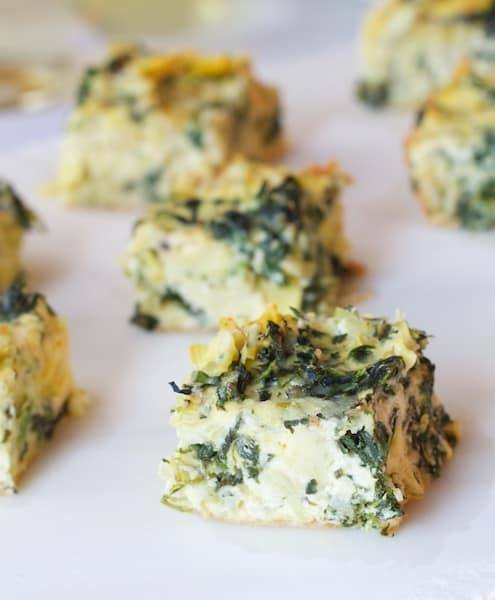 Spinach Artichoke Squares are a delicious low-carb spin on classic spinach artichoke dip! Preheat oven to 350 degrees. Spray an 11 x 7-inch baking dish with cooking spray or lightly coat with oil. Lightly coat the bottom and sides of the baking dish with the breadcrumbs. Set aside. Coarsely chop the artichoke hearts. Combine the artichoke hearts, spinach, scallions, garlic and cheese in a bowl. Spoon evenly into prepared baking dish being careful not to disturb the breadcrumbs. Whisk together eggs, mayonnaise, mascarpone or cream cheese, half-and-half (or milk), salt and black pepper. Pour over spinach - artichoke mixture. Bake 30-35 minutes or until set and lightly browned. Cool slightly on a wire rack. Cut into small squares, arrange on platter, garnish if desired and serve.